I’m going to put my neck out there and say that I truly and honestly admire Arnold Schwarzenegger for what he does in SABOTAGE. This is a Schwarzenegger who realizes that he would look downright silly trying to do the same kind of action movie he did back in the 1980’s. He can’t be the One Man Army Killing Machine anymore. Sure, he’s still in better shape than 90% of us but he’s no kid anymore. And he doesn’t try to hide it unlike the other two members of The Holy Trinity of Action Movie Heroes. Sylvester Stallone and Bruce Willis are still trying to convince us they’re still able to pull off stunts they did 30 years ago. But not Schwarzenegger. He’s got respect for our intelligence. Oh, he still does physical stuff but nothing like the stunts he did in say, “Commando” or “Eraser” These days he’s relying a lot more on story, characterization and supporting casts to give his movies weight. SABOTAGE isn’t a movie he could have made back in the 1980’s. He had to wait until now to make a movie like this where he could make his age work for him and for the character he plays. Don’t get me wrong…this isn’t Schwarzenegger doing Hamlet (and I still say he should have done it. Who in their right mind wouldn’t pay to see that?) but he certainly doesn’t embarrass himself. During a raid on a cartel safehouse, Breacher and his team help themselves to $10 million of the cartel’s money and blow up the rest to cover their theft. They hide the $10 million but when they go to recover it, they’re pissed off beyond words to find it’s gone. In the meantime, the DEA has somehow found out about the stolen money. Breacher is put on a desk job and his team suspended pending an investigation. Six months later and with no concrete evidence tying them to the money, Breacher and his team are reinstated. Turns out that isn’t a favor at all as a couple of team members are gruesomely killed and there’s only two possibilities: either the cartel is killing off Breacher’s team in revenge for stealing their money or it’s a team member who is killing his (or her) partners to keep all the money for themselves. Either way, Breacher’s stuck in the middle. Unable to trust his team or the DEA, he has to rely on the help of Investigator Caroline Brentwood (Olivia Williams) the homicide cop assigned to the case. But can Inspector Brentwood trust Breacher? Because during the course of her investigation she discovers that Breacher just may have more motivation than anybody else on his team to steal and kill for the money. By now you should have tumbled to the fact that Schwarzenegger isn’t playing his usual good guy. In fact, this may be the closest we’ll get to see him playing a bad guy as Breacher nor his team are likeable characters. In fact, they’re all really not much better than the criminals they go after. But that’s okay by me. I don’t need my characters to be likeable. As long as I understand their motivations for doing what they do, I’m cool. 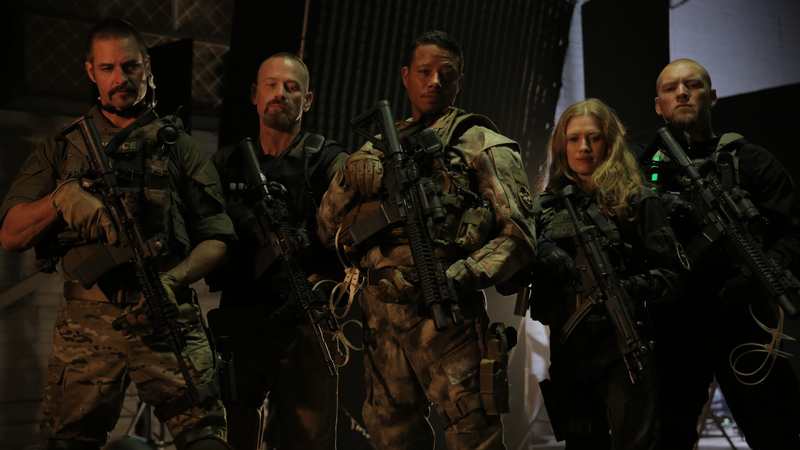 The supporting cast in SABOTAGE is an unusually strong one for an Arnold Schwarzenegger movie and yet another sign that you’re not getting your usual Schwarzenegger Shoot-Em-Up. Terrence Howard and Josh Holloway are members of Breacher’s team while Harold Perrineau is a cop partnered with Brentwood and provides the movie with much needed comedy relief. Believe it or not, it’s Sam Worthington who walks off with the acting honors in this movie as well as Mireille Enos. Their characters are complicated enough to deserve a movie of their own. They’re married DEA agents who have long ago surrendered to corruption and spiritual degradation in the pursuit of justice. Mirelle Enos just about steals the movie from everybody in sight during the third act. What else? Oh, the violence…seriously, this just may be the most violent movie Schwarzenegger has made and considering his track record, that’s really saying something. Director David Ayer is not interested in cartoon violence or the glorification of it. The violence in SABOTAGE is amazingly cruel, bloody and horrifically messy. And Schwarzenegger has got quite the potty mouth as well. I gave up counting after his twentieth F-bomb. So should you see SABOTAGE? If you’re a longtime Arnold Schwarzenegger fan like me you probably already have. But if you haven’t, give it a chance. It’s not his usual action movie and has far more of a mystery thriller aspect than the trailers would lead you to think. I appreciate him always trying to expand the range of what he can do in films and I think that with movies like this and “Escape Plan” in which he also played a different kind of character than we’re used to seeing, he’s showing that Arnold Schwarzenegger still has a lot to offer us. Captured what I was thinking. Spot on. Arnie ageing violently. Well said. I really liked this movie. I think Arnold is much more comfortable with aging than most action stars (and certainly more than Stallone) and he’s been using his age to make some good films. SABOTAGE was a good, hard, non-sugarcoated film. Oh, definitely I agree with you about Stallone. He and Jean Claude Van Damme seem the most committed to proving that they can still do the same stunts now that the did 30 years ago. But to give JCVD his credit, he was in way better shape in overall physicality than Stallone, Schwarzenegger, Norris or Willis back in the day and probably still is.